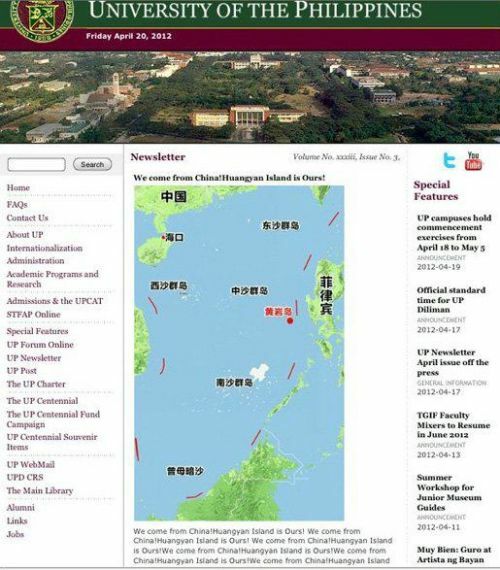 The University of the Philippines (UP Diliman) official website was hacked by allegedly supporters of China. The site content was changed into a map that showed the territorial lines of the country over China territorial boundaries included the Scarborough Shoal. The image map inserted with a text messages below telling that “We come from China! Huangyan Island is Ours!,” the Scarborough Shoal is also known as Huangyan Island. Comments or suggestions about "University of the Philippines website was hacked" is important to us, you may share it by using the comment box below.